In 1956, Benjamin Bloom first described a hierarchy of cognitive skills, with higher-level skills building upon those at lower levels. His hierarchy, and verbs associated with these various levels, have been extensively discussed, revised, and enlarged. Presented here is an adaptation developed by Amanda Karel, including a short description of each cognitive skill. 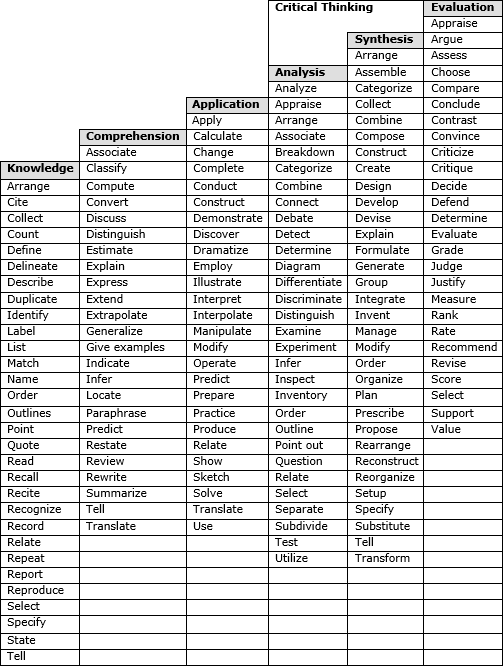 Analysis: Standards that ask the learner to separate the whole into its parts, differentiate between parts, and better understand the organization of the whole and the relationship between the parts.